PowerShell has a whole family of Aliases. One group of these aliases provides shorthand for the regular cmdlets; instead of typing thirteen keystrokes for Get-Childitem, just use a PowerShell alias and type the three letters: gci. However, I am going to concentrate on the other group of Aliases, those cmdlets that are designed to help people migrate from other languages. Thanks to aliases, those who know DOS can still use dir, and those who are familiar with UNIX can still use 'ls' in PowerShell. These old commands work because PowerShell has created an internal link so that when you type dir it translates to the cmdlet Get-ChildItem. I have a tough mission, to persuade people to abandon the DOS command-line and switch to PowerShell. There are three threads to this mission. 1) Have faith that an alias such as cd will change directory in PowerShell just as it did in DOS. 2) Realize that built-in operating system commands such as Ping, Ipconfig and Shutdown work in PowerShell 98% as well as they did with cmd.exe. Consequently, there is no need to use that DOS box, just use the PowerShell command-line instead. I understand that this is a leap of faith, and to begin with may take you out of your comfort zone. 3) The third aspect of the PowerShell alias cmdlets is how they deal with native operating system commands that need user input. For this task we can employ start-Process, or the versatile PowerShell cmdlet New-Object with its -ComObject parameter. I just want to make you aware that interactive command-line utilities, such as NetSh will work in PowerShell, however they need techniques outside the scope of this article. In conclusion, my idea is that you will learn PowerShell faster if you use it for familiar DOS tasks. 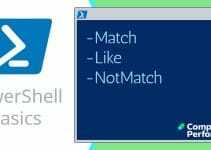 Then gradually, it will become easier and more natural to start incorporating more and more pure PowerShell commands into your working habits. Note 1: The secret of success is employ the -Definition parameter. There are other ways to filter Get-Alias, for example, [a-g]* lists all the aliases beginning with letters ‘a’ through ‘g’. Incidentally, this simple example demonstrates how PowerShell employs wildcards, and also alerts you to the significance of different types of brackets. As ever, you can refer to help, for example type: help Get-Alias. There is also: help New-alias, or even help delete-alias. I have deliberately not emphasised creating your own aliases. My reasoning is this, any aliases you create will not work if you send scripts containing such aliases to other people. This could cause confusion and thus is best avoided especially if you are just starting to learn PowerShell. As you check this list see if you can detect two types of PowerShell Alias cmdlets, those convenience Aliases that simply save key strokes, for example, gci (Get-Childitem) and those Aliases that help people transition from other languages, for example, cd (Set-location). Set-alias eventvwr Get-Eventlog application, however it did not work as I had hoped – too many arguments. Set-alias eventvwr is ok, but rather disappointing because it prompts you for the name of the log. If you really need a more complex set of commands then consider creating a function, which you can then save to the Function ‘drive’, investigate with: Get-psdrive or Get-psdrive function. Suppose you have an Alias called ‘eventvwr’ and also a cmdlet with the same name ‘eventvwr.ps1’, but with different instructions. What would happen is the Alias would be processed first. In fact PowerShell checks the Aliases before it looks for functions or cmdlets. If you just create an alias at the command prompt it is desperately disappointing that PowerShell does not remember your aliases the next time you logon. Good news, you can add your aliases to profile.ps1, the benefit is they will now be available for each and every session.
."C:\ Documents and Settings\EDDIE\My Documents\PSConfiguration\profile_alias.ps1"
If you try this at home, then substitute your username for EDDIE, or else it will not work. N.B. That’s not dirt on the screen or a Guy error, there really is a full stop or ‘period’ in front of . "C: \ ". Some say Eddie is Barking mad, but actually he is from Barking in Essex, either way, he takes this linking idea further and creates a profile_function.ps1 file for his special functions. Can you call an Alias from a cmdlet? The answer is yes, why ever not, remember that cmdlets mimic keystrokes you type at in the Microsoft Shell. My old friend ‘Barking’ Eddie has produced some great PowerShell scripts and at present they work fine. However, Eddie has created a time bomb, the problem is that his cmdlets have so many bizarre aliases that no-one else can understand them. Eddie has no scruples, he is hoping that the people who employ him today, will pay him big bucks to come out of his retirement and fix those cmdlets that no-one else can decipher. The lesson is this, if you only have yourself to please, then create all the aliases that you want. However, if others need to understand or troubleshoot your scripts, then filling them with aliases will only store up problems, which will return to haunt you. To smooth the transition from cmd.exe or other scripting languages to PowerShell. To create your own shortcuts for commands that you use often.